At ALLFIE we believe that it is important to work with Disabled young people to make sure they become empowered adults. We believe they will be the next generation to spread the word about inclusive education. 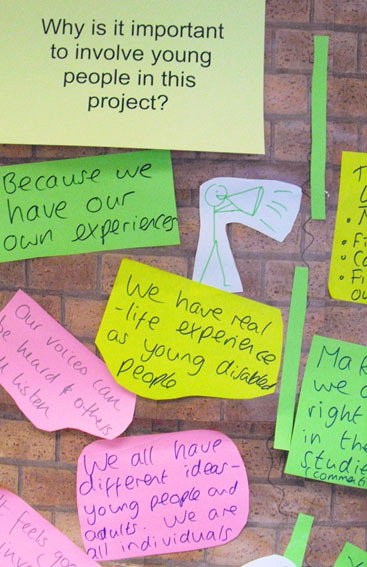 We have been working with young people for many years on projects such as VIPER (Voice, Inclusion, Participation, Empowerment Research) and New Voices. New Voices is a model for the way we work with Disabled young people. It was a project led by young people about how to make mainstream school more inclusive. We worked with young people of different ages, backgrounds and impairments. Our credibility comes from our commitment to young people’s participation and working together with them every step of the way. Our priority is making sure the voice of young people is heard. We want to ensure young people understand they have rights, and have the confidence to make important decisions about their lives. We are committed to ensure that our work around young people remains accessible to young people; we have done this in various ways over the years such as through research projects and training.